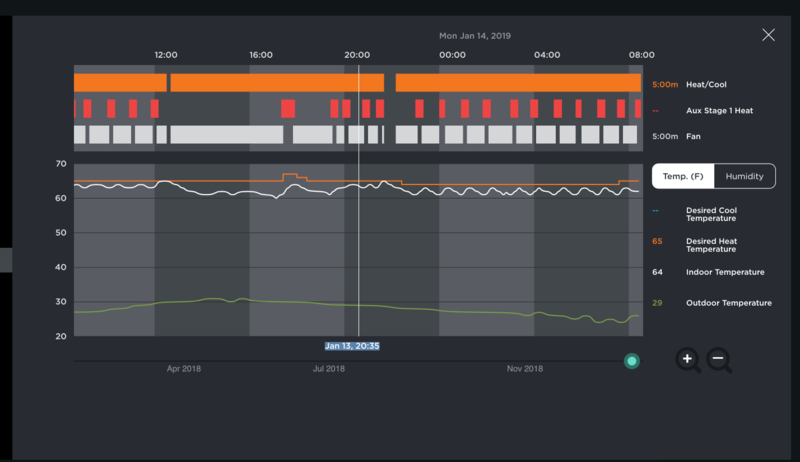 This is my second winter with a heat pump and an ecobee (first year with ecobee4 since last year it was determined my ecobee3 was the problem). I have read the git guide and changed my settings but it seems like the heat pump can’t keep up and ecobee turns on the AUX a lot (about 6 hours). Im tempted to go back to my dumb thermostat. It seemed to handle winters better (when I switched to it after the ecobee3 crapped out). My heatpump is a Goodman GSZ140301KD and im outside of Washington DC. ***UPDATE 2 ***For troubleshooting I ended up installing the dumb thermostat (this will let me see what temp i get from the vents when Aux is off with another thermostat). Also if i call the HVAC company it will save me 80 bucks of them installing it. The HVAC guy came today and ran some tests. He found the pressure in the heat pump was not correct. He looked into the machine and found that one of the pipes has a hole in it and that’s letting the pressure out. The way I understand it is that the system calls for heat on the HP that tries to work but the pressure drops too low so it sends it to AUX then AUX warms up the house, when it’s finished it sends power back to the HP which repeats the cycle. Recovery any Refrigerant that may remains into the system. Removed old Filter Drier and Install a New Filter Drier. Added Nitrogen to clean system and used to brace New Capilar Pipe. Recharged system with R-410A 95 onces (about 6 lbs of R-410A).